After their Splendid Splinter ended his Hall of Fame career with a home run on his last-ever at bat in 1960, Red Sox Nation quickly realized the players they had left offered few if any compelling reasons to travel to Fenway for a game. Truth was, those Red Sox teams of the early sixties were not very good. That probably explains better than anything why Boston’s brain trust decided to rush young 19-year-old Tony Conigliaro to the big leagues in 1964. The hype was that the kid could hit like a young Williams, plus he was born and raised in nearby Revere, had Hollywood good looks and unlike “Teddy Ballgame,” he actually smiled at fans and even signed autographs. So when young “Tony C” went on to belt 24 home runs during his expedited 1965 big league debut season, it convinced the Boston brass that a youth movement was the best path to both a pennant and lots of ticket sales. In the next few years, Red Sox fans were introduced to Rico Petrocelli, George Scott, Reggie Smith, Joe Foy and Mike Andrews. By 1967, the “Baby Sox” had pulled off the “Impossible Dream” pennant of 1967 and had Boston fans wondering who would be the next star flash-produced by the team’s incredible minor league system. 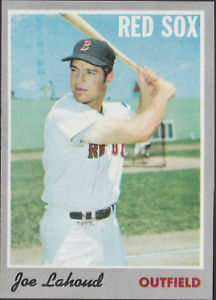 His name was Joe Lahoud, Ironically, his last name was pronounced la-Who, which was the exact reaction most Red Sox fans had when they heard this 20-year-old native of Danbury, Connecticut had made Boston’s Opening Day lineup against the Tigers in 1968. 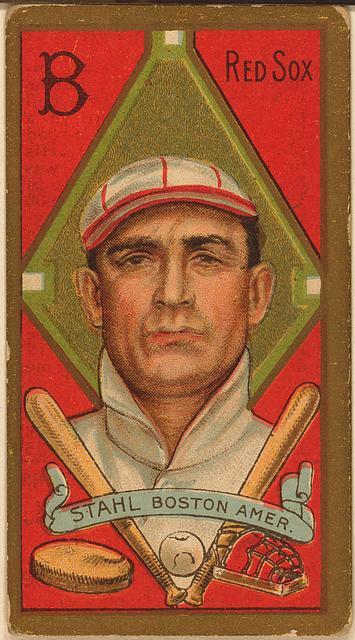 Batting sixth between Scott and Petrocelli, the young outfielder singled, walked three times and scored his first Major League run in that afternoon’s game, a 7-3 Boston victory. The next day the kid hit his first big league home run against Detroit’s ace, Denny McLain and for a brief moment, it really did seem that Boston’s incredibly successful lightening quick youth movement had really struck again in the form of the young LaHoud. By the end of that April however, he was hitting just .206 and got sent down to Louisville for more grooming. He then spent the entire 1969 season with the parent club. Since Lahoud’s ancestors were born in Lebanon, I guess we could call him the Lebanese God of Walks. Like Kevin Youklis a few generations later, Lahoud did not swing at bad pitches. It was his ability to earn frequent free passes to first base that kept him on that ’69 Red Sox roster because he hit just .188 in 257 plate appearances but his 43 walks pushed his on base percentage up to .317. His good eye was not enough to keep him on the big league roster the following season but he did get a second chance with the parent club in 1971. Though he did hit 14 home runs that year, not an easy accomplishment for any left-handed hitter who plays half of his games in Fenway, his .215 batting average was his undoing. That October, he was one of ten players involved in a trade between Boston and the Brewers. Lahoud would end up spending whole or parts of 11 seasons in the Major Leagues. He put together his best season as a fourth outfielder for the 1974 Caifornia Angels, when he hit a career high .271 and smacked 13 round-trippers. His final season was 1978 and when he quit he had a lifetime batting average of .223 with an on base percentage that was one hunted and ten points higher.